The Sapphire is specifically designed to be a lightweight and attractive carrying knife. It is the perfect choice in the office or out on the town. 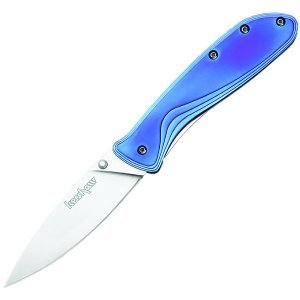 The pocketknife features super-smooth, one-handed, manual opening. The user simply places his thumb on the thumb stud and pushes the blade out of the handle, following its natural arc. Naturally, the Kershaw blade is as impressive as the handles. The conveniently sized, 3-inch blade is built of AUS8A premium, high-carbon stainless steel and honed to Kershaw’s famous “shaving sharp” edge. A stainless-steel locking liner holds the blade securely in position after the blade is deployed. The locking liner can be released by pushing the liner to the side and folding the blade back into the handle for secure storage. Closed, the Sapphire measures four inches in length. It weighs a pocket-perfect 2.3 ounces and comes with a removable pocket clip. The pocket clip can be moved for “Tip up” or "tip down carry. The Sapphire is built to maintain Kershaw’s worldwide reputation for quality and innovation. The company prides itself on using the highest quality materials and state-of-the-art techniques to produce knives and other cutting tools that are prized throughout the world.